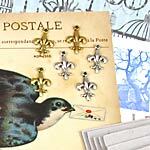 Shown as part of a Blue Birds/Paris-themed Giveaway (click to see all the prizes). Lots of sizes, from ATCs, square memory glass and inchies to slide glass. The sizes work well with standard 1" x 3" microscope slides. Good, basic images in subtle/ephemeral tones for backgrounds (or primary images), from sheet music and the Eiffel Tower to architectural details and bare winter trees.